I had a good couple of weeks after my last entry. I made it up to a mile on my walks. Scott went with me once and I was able to keep up with him, something I hadn’t been able to do in a long time. My yoga practice got stronger. Pain levels stayed down and my hope soared for a good summer with some hiking in the mountains. And then it changed again. I started having more pain in the left hip. It would be two good days, one bad day, a good day, two bad days. Very up and down, unpredictable. The pain in Lefty is different–sharper, more insistent and more resistant to pain relief. I started to have some nights when, even after 2 doses of ibuprofen, I was still aching and unable to sleep. The left hip began to give out on occasion, which didn’t happen until later in the process with Righty. Lefty continues to get noisier–lots of clicking and clacking when the joint moves in certain ways. Righty was always silent, never letting on about the severe damage inside the joint, which was why none of us ever suspected severe arthritis. During my last massage, my therapist noticed that the right hip was much better than the left for the first time. The joint and surrounding muscles on the left were all tight and painful, very similar to how they had been with my right hip prior to surgery. I decided that I would see how our February 20-23 trip to Las Vegas went, with all the walking. If it went badly, I’d call my surgeon. I just returned from this trip (fun adventure with all our elders along for the experience). On the first day, Scott and I walked from the Bellagio to New York New York and back, about 2 miles. It was the longest trek I’d made since the surgery, and I wanted to see how I would do. Turns out the 2 mile jaunt after walking in the airports and in the Bellagio (where we stayed) was way too much. The muscles in my right hip got tight and fatigued and I kept having to stop, stretch them out and rest (thank goodness for all the chairs in front of slot machines in Vegas!). And my left hip was very unhappy. Once we got back to the Bellagio and I could rest, my right hip released and the pain went away. But the left hip just kept aching, all the way through the night and into the next day, despite two doses of ibuprofen. After that, I didn’t walk as much, often opting to hang out with my 92-year-old father-in-law who is more my speed! Now that I’m home, the right hip feels like it is getting better and stronger all the time. But, my left hip remains achy. I’m beginning not to trust it to hold me up, and my stride is again shrinking. 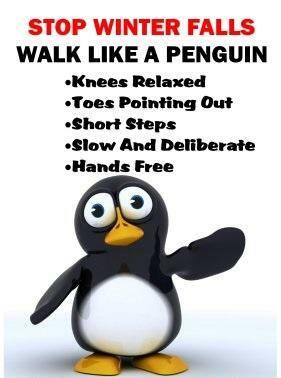 So, I’m penguin waddling a lot. This is not helpful for rehabbing my right hip, which really needs to be walking more now. I’ve got to say this little face captures how I feel, only I’d add some tears rolling down the cheeks. I took another spin on the “releasing expectations” wheel and am trying to wrap my head around this. Yesterday, I called my surgeon and made an appointment to see him in March to discuss the replacement of my left hip. It is hard to even write that sentence, but I did promise that I wouldn’t sink into denial and let this one go so long, and I intend to keep that promise. I’m hoping the recovery will be better as a result. I remember being so hopeful at the four-month mark that I would get a reprieve from another surgery for the summer. I am so bummed about losing another summer of camping and hiking. I was really looking forward to that. But, I have had the joy of many summers in the high country and I believe there will be many more once this ordeal is behind me. I continue to be thankful this is all fixable, and there are definite benefits to doing it sooner vs. later. So now it’s time to face reality, dig deep and fan the flames of my positive attitude. This entry was posted in Hip Adventures on February 27, 2018 by Rhonda Ashurst. Is this how freedom dies in America? Our forefathers believed these rights were important enough to their new democracy that they placed them first on the Bill of Rights. What is happening in America when our President essentially makes a statement indicating that if you do not applaud him, you could be considered guilty of treason? What is the punishment for treason in the United States? Today the White House spokesman said President Trump was joking. This is not something the supposed “leader of the free world” jokes about. It seems he’s fishing to see what our response will be. Who will support him in making, and possibly, enforcing this kind of outrageous accusation? If we show support, then it could solve all his problems with the Democratic party (and democracy) in one fell swoop. Freedom in America dies and another authoritarian dictator rises. If you care about freedom in America, now is a good time to speak up. I was pleased to learn that the Reno Gazette Journal chose to publish this piece on their Opinion page. I was also heartened to see they included footage of Republican Senator, Jeff Flake’s response to Trump’s comments. Opinion Published in Reno Gazette Journal. This entry was posted in Reflections on Current Events on February 6, 2018 by Rhonda Ashurst.